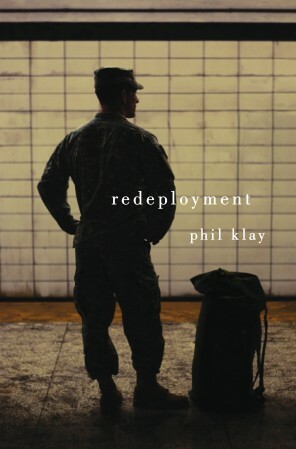 Congratulations Phil Klay on winning the 2014 National Book Award for fiction for Redeployment! Below is a repost of my review from earlier this year. 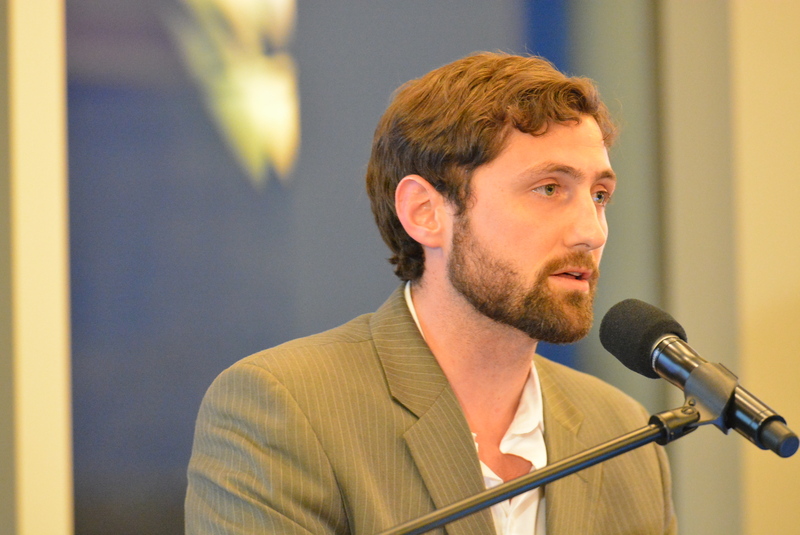 Phil Klay reading at West Point, April 2014. 2012 was as good a year for contemporary war fiction as we’re probably going to get, what with the publication of The Yellow Birds, Billy Lynn’s Long Halftime Walk, The Watch, and Fobbit. 2013, by comparison, saw only Roxana Robinson’s Sparta make anything close to the splash of the previous year’s bumper crop of war novels. Now, early in 2014, comes Phil Klay (the last name rhymes with “sky”) and his collection of short stories Redeployment. Riding a perfect wave of full-tilt advertising push from publishing giant Penguin, Redeployment has garnered glowing reviews from the New York Times, the Times Sunday Book Review, the Washington Post, the Daily Beast, the Wall Street Journal and the Internet media sphere. While not a novel, Redeployment lights up the contemporary war fiction scene while readers wait for the next great novel to come along. And why not? A Dartmouth grad and former Marine who spent a year in Iraq as a personnel officer, Klay brings a lot to the table. He has an impeccable ear for soldierly speech and while in was obviously on high alert for the nuances of military life. He observed, for example, the differences in the deployment experiences and outlook of a wide variety of service members, ranging from infantrymen, artillerymen, and military police to chaplains and civil affairs officers. One story in Redeployment, “Psychological Operations,” is narrated by an ex-enlisted Army soldier, an African-American Coptic Christian who studies at Amherst, a narrative persona that pretty much takes the cake for imagination. But Klay’s characters are always believable and distinctive; as the reviewing cliché goes, they are “fully realized”: round not flat, capable of change, growth, and surprise. Even better, Redeployment‘s tales are, as another cliché has it, “fully imagined.” Obviously not all autobiographical, they appear to be artistically rendered amalgams of overheard war stories that Klay twists, turns, and combines in unexpected ways. Chuck Palahniuk writes in the forward to Fight Club that “To make the [original] short story into a book, I added every story my friends could tell. Every party I attended gave me more material.” Palahniuk’s tactic seems to have been Klay’s; my only wish, actually, is that Redeployment were also a novel–so many of its discrete chapters are ripe for expansion or linking with others to create a more comprehensive and blended long narrative. A whole lot of knowingness goes into the composition of a paragraph like that. As units, each with their own personality and level of competence, and compromised of individuals equally distinctive, pitched into their missions in Iraq and Afghanistan, what happened next was idiosyncratic, variable, and contingent. “You go to war with the military you have,” Donald Rumsfeld was widely derided for saying, but he wasn’t wrong at the level of the individual–you go to war with who you are, constrained by the limits of the unit of which you are a part. Every soldier up to his or her ears in the messiness of combat knows this in ways hard to fathom by those who might be tempted to think that decisions and choices were easier than they were. Redeployment doesn’t portray the military as screwed up beyond repair or chance of victory, but Klay does suggest that the Marines he was with were overmatched by the demands of the mission and loftiness of the Corps’ ideals and publicity. “Iraq,” the narrator of “Unless It’s a Sucking Chest Wound” asks, “What do you think? Did we win?” “Uhh… we did OK” is the response from a warrior said to have earned a Bronze Star with a V device for valor. “Prayer in the Furnace” burns as hot as its title implies, but Klay works in registers other than the grim and deadly. “Money as a Weapons System” is not exactly bloodless, but it humorously exposes the fraudulence and ineptitude of military nation-building endeavors. Having wondered at the failure of my own unit’s humanitarian assistance missions, Commander’s Emergency Response Program projects, Provincial Reconstruction Team efforts, and NGO programs in Afghanistan, where shot-up and abandoned clinics, schools, irrigation systems, and women’s centers littered the land, I was half-horrified, half-pleased to see something so similar vividly recreated in Redeployment. The story soars on the strength of its skewering of absurd and hopeless “non-kinetic” civil affairs missions and the liveliness of the characters who try their best, or at least reasonably hard, to execute them. Klay’s gift for character shines in his portrayal of Major Zima, an overweight civil affairs officer who is consistently underestimated by the leaner, meaner, and supposedly swifter narrator. Part Falstaff, part Machiavelli, Major Zima is the only character in Redeployment who renders the slightest modicum of aid to the Iraqis outside the FOB while not being brutalized by the military bureaucracy within it. Certain places. Iraq. Home again. This entry was posted on March 18, 2014 at 9:17 pm and is filed under Art and War. You can subscribe via RSS 2.0 feed to this post's comments.